AEGEE-Patra proposed a magnificent TSU showing the best of Peloponnese on the initiative of Flo Fotini Karagrigori, Stavroula Kostakopolou, Secretary of this Greek Antenna, Vasiliki Petrakou, President, and the extraordinary help of an amazing team. Journalist Matteo Lai reports on this international event that was in collaboration with the Democracy in Practice project. 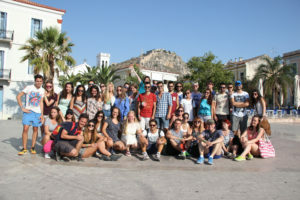 The Summer University of AEGEE-Patra began on the eleventh of July 2016. In Athens, I had already met some participants, Ana and Alvaro, and one organiser, Spyros, who hosted me during the previous weekend, and gave us a small city tour of the Greek capital. With other guys, who were joining the event, we reached Patra very late by bus; about nine p.m. The Greek organisers, however, could not let us miss out on some ice breaking games, so that we at least got to know the name of the other participants. They came from every corner of Europe: Dario Renna (Italy), Natalya Turun (Ukraine), Ihor Raynovskyy (Ukraine), David Ferre (Spain), Olga Revilla (Spain), Ana González García (Spain), Robert Bullesfeld (Germany), Joyce Schulte (the Netherlands), Álvaro Alonso Larré (Spain), Anna Zaiats (Ukraine), Strahinja Kocijasevic (Serbia), Enrica Griggio (Italy), Diego Laino Rebollido (Spain), Alessandro Boffa Fasset (Italy), Irene Ballester (Spain), Matteo Delfino (Italy), Adela Hurtikova (Czech Republic), Anna Temerko (Ukraine), Matteo Sberna (Italy), Merli Martin (Estonia), Sophia Talvoysh (Russia), Maria Calin (Austria), Alicia Jiménez Nosti (Spain), Julia Sohu (Spain), Mikel Larra Arca (Spain), Ella Katkova (Russia), Fernando Berniola Cassorán (Spain), Lili Dozsa (Hungary), Arbenita Hasani (Austria), Kagan Kemal Tuna (Turkey) and a girl simply known to us as Burcu (Turkey). The organisers were: Noemi Lowy (Democracy in Practice Trainer, AEGEE-Debrecen), Vasiliki Petrakou (Main Organiser and President), Petros Spyratos, Spyros Ntouroukis, Fotini Flo Karagrigori (Main Organiser and Secretary), Stavroula Kostakopoulou (Main Organizer and Incoming Responsible), Raphael Angelis, Stavros Vlatakis, Giota Grintzou, Petros Vezos, Katerina Anastasopolou (AEGEE-Athina), Akis Tampachaniotis (AEGEE-Peiraias), Costas Frem, Costantinos Fasourakis, Yiota Mitropoulou, Anastasia Karantza. After a quick dinner outside the hotel, we all went together to a lounge in a pub, ten minutes away from the hotel that was our accommodation for the first four days. I was really tired after the long trip from Athens to Patra, but I could not wait for the interesting programme that the organisers had crafted for us. Patra is famous for the Rio-Antirrio Bridge, the longest suspension bridge in Europe. In Patra, I also visited the Apollon Theatre, which was designed by the famous German architect Ernst Ziller and completed in 1872. The Apollon is located east of Georgiou I Square, one of Patra’s most popular squares. The theatre is a micrograph of “La Scala” in Milan, and is the oldest existing enclosed theatre of the same era. The Apollon Theatre has been the main stage of the Patras Municipal and Regional Theatre since 1988, and can hold up to three hundred people. The TSU was in collaboration with the ‘Democracy in Practice’ project. For the newbies in AEGEE, the aim of the project is to raise awareness among young people about the importance of human rights as the basis of a healthy democracy, in order to promote social and political participation of young people at local, national, and European level. This can be achieved in two ways: by means of training, and by means of advocacy. Therefore, the members of Democracy in Practice set some learning objectives and some advocacy objectives. The former required the participants to explain what the interconnections between human rights and democracy are, to develop a campaign for Human Rights, to direct their own learning through the process, and to develop a concrete action plan in order to start a follow-up process. Advocacy objectives are various as well: the participants can identify the local stakeholders for human rights education; the participants are able to advocate for human rights education in their local communities, specially targeting universities and other educational centres. There have been many sessions that allowed us to know each other better and to discuss about Europe. 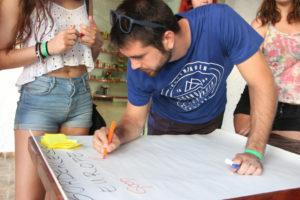 For example, at the Gythio campsite, Noemi asked us to write down some words that we associate with Europe: peace, freedom, security, human rights, prosperity, language, mobility. 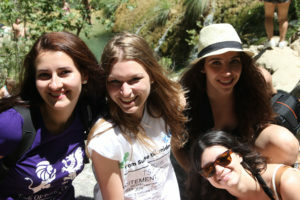 She also proposed us to watch a movie titled: “The Untouchables”, which topics were discussed during our stay in Patra. On the third day, we spent the evening in Plaz, a beach close to Patra’s city centre, where we enjoyed the European Night, a traditional activity in every Summer University. 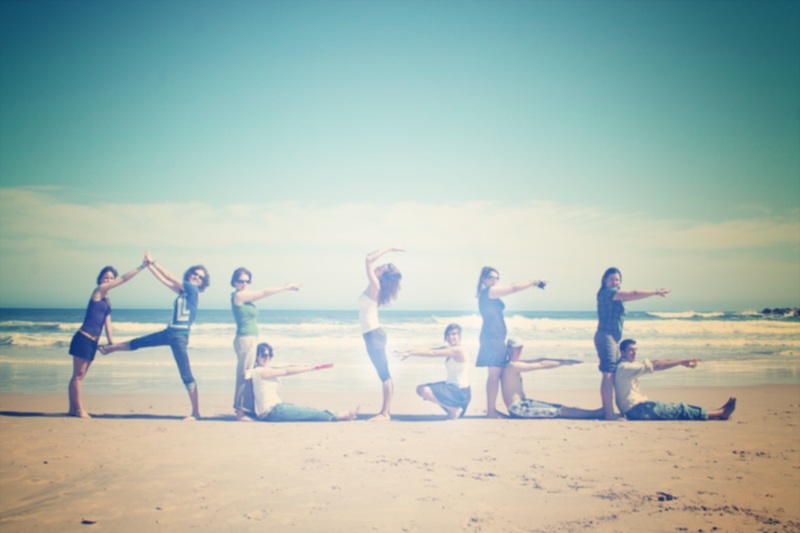 The organisers decided to surprise us by showing their European friends the basics of some popular Greek dances. Then, Stavroula would not be amiss to show us the famous ‘Ouzo’, an alcoholic drink very similar to Sambuca with the flavor of anisette. On the morning of the day after, we followed a Democracy in Practice session about the structure and organisation of AEGEE. Noemi also talked about several AEGEE projects you can join, such as The AEGEEan. Later, the protagonists of this amazing Greek adventure visited the Achaia Clauss winery where they relaxed, chatted and made some group photos. In the Youth Mobility Workshop, David explained to us the incredible advantages of living on a new planet with his “Apollo Mobility Program”. The participants were involved in D.i.P. activities almost every day, but we also went to Ancient Olympia, known for having been the site of the Olympic Games in classical times. In the 10th century B.C., Olympia became a centre for the worship of Zeus. The Altis – the sanctuary to the gods – used to contain one of the greatest collections of masterpieces from the ancient Greek world. In addition to temples, we saw the remains of all the sports structures, which had been erected for the Olympic Games that were held in Olympia every four years. The first ever Olympic Games were held in honour of Zeus. After some hours at Kaiafas beach, we visited Kalamata. The city tour was guided by Dimitri Eliopoulos, former director of Alpha Bank, who spoke more Italian than Greek or English. On Sunday, we went to Polylimnio for river trekking. The course ended at a lake and some Spanish guys inaugurated a dive competition from very high rocks. In Methoni, we managed to make some group photos over the rocks near a castle without falling into the water. 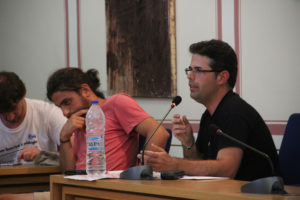 The day at Kalamata’s city hall was the best for me. After we were welcomed by the mayor, we made an analysis and comparison of the situation of human and fundamental rights in several European countries. We were divided into small groups on the basis of our country. I still cannot believe it, but I talked in front of forty people in a foreign language about the Italian Constitution, while expressing my opinion about some current problems of Italy without getting nervous. I would have liked to answer some questions, but it was also important to talk about countries where the problem of human rights is probably much more felt, countries such as Ukraine, Russia and Turkey. In Kardamyli, thirty-five kilometers southeast of Kalamata, in the region of Messenia on the Mani Peninsula, we admired the Mourtzinos Tower and the Church of Ayios Spyridon. After enjoying the sun at Stoupa beach, we reached the third Greek town of this vacation, Gythio, where we celebrated at the Hippie Hippie Shake Party. One of the places that fascinated me the most was Monemvasia Island. Monemvasia is a town and a municipality in Laconia. The town is located on a small island off the Eastern coast of the Peloponnese. The town’s name derives from two Greek words, “mone” and “emvasia”, collectively meaning “single entrance”. Many of the streets are narrow and can only accommodate pedestrians and donkeys. A small hamlet of about ten houses lies on the northwest. The most interesting aspects of the island were for sure: Christos Elkomenos Square, the church of Agia Sophia, and the fortress. There was a very strong wind around the island, but that didn’t stop me from enjoying a wonderful excursion. Another interesting archeological site was Mystras, a fortified town and a former municipality in Laconia, always in the Peloponnese, situated on the Taygetos mountain, near the ancient Sparta. In the next chapter of our journey, we arrived in Mycenae (or Mikines). In the second millennium BC, Mycenae was one of the major centres of Greek civilisation. I got petrified when I saw the Lion Gate, because I had only seen it in my history of art text book. On the last two days of the TSU, the accommodation was in a campsite in Napflio. During those couple of days, we went on a cruise discovering the Hydra and Spetses islands. In Hydra there were no cars, but a lot of mules instead. On both islands the water was crystal-clear. At the end of the SU, the organisers brought us to the ancient theatre at Epidauros: among all the ancient theatres, this one was the most beautiful and best preserved. And although it was very hot, I could not resist the temptation to climb up the steps to the top of the theatre. 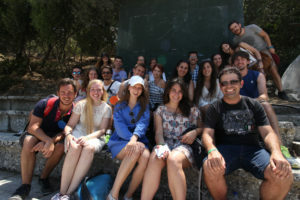 The organisers of AEGEE-Patra did a really good job; some of them have been very affable with the most shy participants, and they have created and nurtured a group that wanted to have a lot of fun. Sometimes they had to modify the timetable for the evening programme by the request of most of the participants; such as when we asked to include one more party on Gythio beach. In the discos, someone among the organisers could not bare to see you sit on a chair, so they immediately grabbed you by your arms and made you fly on the dance floor. They showed to be very experienced after their Agora in 2014. Not everything was perfect and there were some aspects that need to be improved for next year, but the organisers were also warm-hearted. When I got sick, guys like Raphael, Vasiliki and Stavros took care of me without hesitation.